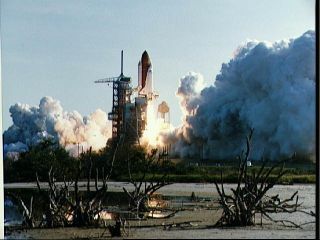 A view of the launch of the shuttle Discovery on its STS-41D mission. The orbiter is seen just leaving Launch Pad 39A with clouds of smoke below it. CAPE CANAVERAL, Fla. — As six astronauts engage in one last mission aboard the space shuttle Discovery, Mike Coats, director of NASA's Johnson Space Center in Houston, knows what it feels like. After all, Coats was the pilot for the shuttle Discovery's very first mission — the STS-41D flight that marked the beginning of the shuttle's 27-year spaceflying career, which will end in retirement after this trip to and from the International Space Station. The official portrait of astronaut Michael L. Coats for the space shuttle Discovery's STS-41D mission. SPACE.com: You were a part of Discovery's maiden voyage. What has it been like for you, watching as Discovery gets ready to launch on its final spaceflight? Michael Coats: Well, it's obviously a bittersweet feeling. I've got mixed emotions. I'm always proud when we're launching any of the shuttles. I'm just so proud of the teams — the thousands of people around the country, and around the world — that make it possible to launch the shuttles, and go up and do the things we do on the space station. From my perspective as director of the Johnson Space Center, I get to see parts of the team working together. I get to travel around the world and meet the people who are working hard to do the research that we're doing on the space station. And so it's a real privilege for me to see the team. I wish the people around the world could have an understanding and appreciation of the amazing, highly motivated group of people that work in the space program. They make the impossible possible, and sometimes they even make it look easy. And it's not easy. Getting into space, operating in space — it's a real challenge. It's always going to be a challenge. So it's bittersweet. I'll be really sad when Discovery rolls to a stop for the last time, because then they'll take it and put it in a museum. You know, at my age I see a lot of planes that I flew more than 40 years ago in museums, but seeing the spaceship that I flew in a museum is going to be really hard. SPACE.com: In a sense, Discovery's STS-133 mission marks the beginning of the end. As we approach the retirement of the space shuttle program, how would you sum up the impact of the shuttles? Coats: I think it's been an amazing vehicle. The capabilities and the complexities of the shuttle are astounding. But that same complexity gives it the capability that we couldn't have dreamed of even 45 years ago. It's just incredible, and I think we're going to miss that. The shuttle can take incredible amounts of weight and mass into orbit. And we can bring it home. It's a truck — nothing else can lift as much as the shuttle. So, we're going to miss that capability. We can't go out and repair satellites like we've done for the last 30 years. So it's sad, in a sense, to see it come to an end. SPACE.com: So what excites you most about NASA's future, and the future of space exploration? Coats: What excites me right now is the International Space Station. It's truly an international space station. It's a grouping of laboratories — European, Russian, Japanese, American — that are all world-class laboratories in and of themselves. The research that will be done, and is being done, on the International Space Station is going to benefit us for a lot more than the next 10 years. I'd like to keep it going for a long time, because I think it will benefit mankind. If we're going to explore beyond Earth, which I think is the real goal, we've got to know how to be self-sustaining. We've got to learn how to recycle everything — water, air, everything. The technologies that we're mastering with the space station right now, and the ones that we could put on a spaceship that leaves us for two to three years, are the same technologies that are going to help us protect Mother Earth. And every astronaut, every cosmonaut, anyone that gets out there and looks back at the Earth just goes, "Wow." You see the Earth, and you want to put your arms around it and protect it. Here's this beautiful, living spaceship with billions of people on it, going through this great big, black void out there. We've got to take care of this little place. We're going to explore the solar system, and we may explore the universe someday, but there's going to be many, many generations that are going to live here on Earth. We need to take care of this planet. Anyone that's flown in space feels very strongly about that. And the technologies that we're mastering on the space station are going to help us take care of planet Earth. SPACE.com: The space shuttles have been such iconic symbols of this country's space program. How do you hope younger generations will remember the legacy of the space shuttle program? Coats: I think we're really going to miss the shuttle when it's gone. I see that already. People are saying, "What? We're not flying them anymore?" We've been flying the shuttles for 30 years, so we've got several generations that know nothing else but the space shuttles. I think it's going to be a shock to a lot people that we're going to quit flying the shuttle, and we're not going to have anything nearly as capable as that. But I think the shuttle program inspired a lot of young people to go into math, science and engineering over the years, and I think that's very important. If we're not innovative and creating new technologies and creating new businesses and jobs, we're not going to be economically and globally competitive in the world. Other countries know that. I know the shuttles have been instrumental in inspiring people, because they contact me, asking if they should come to work in the space program. And I say, "You bet, you'll love it." And they do. It's been very satisfying and rewarding to see that. Almost everybody I know that works in the space program loves doing what they do. It's a pretty nice great place to work. SPACE.com: What's your fondest memory of Discovery? Or your fondest memory from Discovery's first flight? Coats: Well, the fondest memory was after we landed and I got to hold my wife and kids again. That was a nice memory. You know, because we climbed in four times before we finally launched, and we had the first pad abort and then fire on the launch pad, and it was all stretched out over two months. So when we finally lit the solid rocket boosters and we were really going, it was almost a feeling of relief. And for about 10 seconds you go, "Oh, thank heavens, we're going." And then you realize, "Oh, I better pay attention!" I'll tell you, the feeling that is still so vivid in my mind is looking out the windows when you get into orbit, and looking at the Earth for the first time from space, and seeing this living planet. The colors — the blues of the oceans, the greens, the browns — it's just obvious this is a living planet. And this living planet is going through this big, black void. That's the perfect word because there is nothing out there. The stars don't twinkle out there; they're just harsh points of light. And the whole time you feel like we've got to take care of Earth. The blackness of space and the bright living beauty of the Earth just amaze me, and I think they have the same effect on anyone who has been up there. SPACE.com: Did you pass along any words of wisdom to the STS-133 crew? Did you give Commander Steve Lindsey any advice? Remember, I get to do the final approval for all the crew assignments, and when we assigned Steve, we thought this one was going to be the final shuttle flight. So, I've been teasing him that he's not only not going to be commander of the last one, he may not even be commander of the next-to-last one. But I told him he does have the last flight of my bird, so he better not break it.